Bob McNab was born on 20 July 1943 in Yorkshire. Happy 69th Birthday Bob. After playing 68 times between 1963 and 1966 for Huddersfield, he was signed by Bertie Mee in October 1966 – two months into Mee’s reign. He replaced David Court at right back on October 15th in the away defeat to Leeds and kept his place making 25 appearances in that first season. In 1967 Court regained his place for the first could of matches but by October Bob was back, although this time at left back. He made 30 appearances that season including an appearance in the League Cup final. For 1968/9 Storey moved to right back, Court moved into the forward line and Bob McNab played at left back. Although the defence of that season is not spoken in the hushed reverence reserved for the Graham defence, it is worth noting that the back three of Wilson, Storey, McNab each played all 42 league games, all four FA Cup games, and all seven League Cup games including the final in that season. And it was all only just beginning. In 1969/70 Bob won the Fairs Cup and in 1970/71 won the league, now playing alongside Pat Rice who had the right back position. He also, of course, won the FA Cup. However half way through the 73/4 season he got injured, with Sammy Nelson deputising. He was released in the summer of 1975 having played 365 matches for Arsenal, scoring six goals. By this time however he was also appearing somewhat on ITV as a pundit especially around the World Cup. Bob then went on to play 13 league games for Wolverhampton before moving to the US league, but then came back to play for Barnet. At least according to all sorts of web sites Bob did – but how many games did he play? I can’t find out, the Barnet web site doesn’t have a section on that, and no one knows. Anyone a Barnet fan who has any idea? Bob, if you are reading – how many games did you play for Barnet? Bob then moved into management with Vancouver and Tacoma, before taking over as caretaker manager of Portsmouth in 1999 after Alan Ball was relieved of his duties – and that I think was the end of his time in football. According to a Huddersfield paper in 2011, which had an article on Bob when Arsenal played Huddersfield in the cup, Bob worked or maybe still works as a property developer in Los Angeles. His daughter Mercedes McNab was in the Addams Family movies and played Harmony Kendall in Buffy the Vampire Slayer and Angel. She also starred in the movie Hatchet and other horror movies and TV series. I don’t actually expect any of the people written about in these columns to read what we say, but occasionally those related to the players do drop me a note to say that they have seen the piece and passed it on – which is great. If that’s the case here, please pass on the very best regards of the Arsenal History Society, and of everyone at Untold Arsenal to Bob on his birthday. It was, of course, a great pleasure and delight to watch Bob play and we remember him as a player with enormous fondness. (And don’t forget to ask him about Barnet). If you think you know your Arsenal, it is time to think again. Never before has one book overturned so many myths and revealed so many secrets about a club. Woolwich Arsenal, the club that changed football. John is correct, as George Eastham was the only player on the 1966 team who had yet played for Arsenal, and Bertie sold him to Stoke prior to the next season. Alan Ball was later brought in, although he was with Blackpool at the time. In the film version of “Fever Pitch,” Luke Aikman, playing younger Paul, mentions that Bertie wouldn’t be willing to risk Bob in the 1972 FA Cup Semifinal against Stoke (with Eastham and fellow ’66 hero Gordon Banks), due to injury. But in the book, Nick Hornby suggests that Bob did play in that game. Does anyone know if which got it right, the book or the movie? 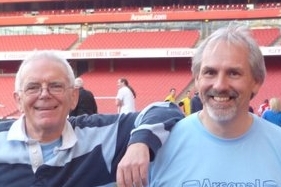 Mike, Bob played in both the semi-final games against Stoke in 1972. He also played in both the semi-final games in 1971.